JP Mallory: The Origins of the Irish, Thames and Hudson, London, 2013. There’s good reason that most archaeologists wouldn’t touch the subject of Irish origins with a barge pole: the topic involves a very unfashionable cultural historical approach to the archaeological record of a period of Ireland’s existence which is clouded in obscurity andentails a morass of issues that most archaeologists spend a lifetime trying to avoid. Mallory then proceeds to venture where others fear to tread. He starts in deep time, with Ireland’s gradual emergence as an island in a world of shifting continents and climates. Ireland’s first colonists were Mesolithic hunter gatherers, who arrived late in the day – around 8000 BC, when Australia, for example, had already been inhabited for millennia. The world was warming after the ice and the seas were rising. The colonists’ immediate point of departure was most probably the low-lying basin around the Isle of Man, drowned by rising water. Their numbers, after settlement, are unlikely to have exceeded 3,000. They had both fish and plants to live off, but in terms of prey Ireland was one of the poorest places in Atlantic Europe. Yet the wild pig, a denizen of deep forests, appeared – an importation, it is suspected. Ireland was not isolated; we can assume the development of extensive maritime traffic. Around 3800 BC, in the Neolithic era (4000-2500 BC), a revolution happened, called farming. It is likely that both the idea and the practitioners came from Britain, a connection strongly suggested by similarities in architecture, flint tools, ceramics, tomb types and ceremonial structures. Towards the end of the period metallurgy was introduced, accompanied by elegant ceramic containers known as ‘Bell Beakers’. The latter integrated Ireland into a network that covered most of western and central Europe, and it is likely that there was some associated immigration. With metallurgy came the Bronze Age, and the emergence of a warrior elite. Hillforts appeared, suggesting some settlement from Britain, with similarities in ritual behaviour. Iron followed bronze (from around 600 BC), and with it the La Têne style, commonly associated with the Continental Celts. In Ireland it was an elite regional style, not found in Munster. There is no evidence that the Iron Age or La Têne were the result of invasion, though there was intimate contact with Britain and the Continent. There is plenty of evidence during the Later Iron Age of trade with the Roman world, and even some evidence of Roman settlement. One of the results was pre-Patrician Christianity. Mallory also discusses what he calls ‘the native version’. He concludes that the official acount of the peopling of Ireland was constructed by Christian monks between the 7th and the 11th centuries and was modelled on biblical accounts of the wanderings of the Jews. There is no convincing Irish testimony that would associate Irish origins with Iberia (though the genetic evidence is interesting). In the earliest native traditions the ancestor of the Irish was a figure (Donn) who was also lord of the dead. So far we have a succession of cultural influences, sometimes accompanied by immigration. What does genetic research tell us? Mallory offers us different conclusions. It is agreed that the main genetic basis of the Irish population is the male and female lineages who entered Europe after the last Ice Age. One could argue either that there is no significant evidence of post-Neolithic immigration or that the major male genetic line may have entered from the Neolithic onwards. Clearly there is a need for further testing of ancient DNA. It has also been argued that most Irish genes would appear to link back to an ancient refuge area in southern France or northern Iberia. Language is of importance in questions of identity, and there were probably several periods of language shift in Ireland. It is highly unlikely that either the Mesolithic language of the first colonists or the Neolithic language of the first farmers was related to Irish. The Irish language in its earliest form probably arrived between 1000 BC and the first century BC, with evidence for Celtic tribal names in Ireland in this period. Proto-Irish must have had a competitive advantage; it probably entered via Britain from multiple staging areas and was initially the language of certain important social domains associated with hillforts, a warrior elite and Iron Age ritual centres. From there it spread, as English was to do later. The appearance of an Irish ‘national consciousness’ can also be linked to the five-province division of Ireland (the fifth being centred on Tara in Meath). Mallory describes this as a cultural cosmology, an ideological rather than a political concept, and thinks a case can be made for its origin in the Iron Age. This can be linked to a common language and cultural institutions, also products of that period. 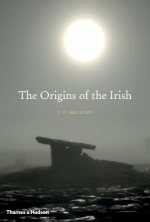 Mallory is aware of the fact that the thing he seeks is complex: ‘The origins of the Irish is not a single question and one should not expect a single answer’. He is aware of ambiguities and absences in the evidence and of a variety of possible interpretations. What he gives us is tentative answers based on the highest degree of probability, while being aware that the next turn of an archaeologist’s shovel might lead to other explanations. That said, this book represents the best and latest summary of a complicated subject, and one written in a most readable and engaging style. Colin is a Melbourne poet, scholar, Irish language speaker.